By David Ponce on 08/26/11 • Leave a comment! This is a Sponsored post written by me on behalf of Sprint. All opinions are 100% mine. I know this girl who’s gone through six phones in the last year. That’s a lot of cash as well as a lot of begging her friends on Facebook to send her their contact information again. But we live in a world where such things don’t need to happen. Well, losing will happen, but the finding the phone again part should be a cinch. Sprint customers for instance can enroll in the company’s Total Equipment Protection program. It’s an $8/mo. option that allows them to install an application on their Android, Blackberry and select phones and keep track of their device at all times. It also syncs their contacts with Sprint’s servers so that even if the phone is not located or was destroyed, the annoying process of rebuilding one’s contact list doesn’t have to happen. Aside from locating the phones and syncing the contacts, Total Equipment Protection also allows you to lock your device remotely, or altogether wipe it. You can even activate an alarm should you be in the vicinity of the phone but can’t quite locate it. Sprint users have until August 30th to enroll. If you read my review of the iPad earlier today, you probably noticed my little rant about the internet connectivity. While I have no issue with paying a little extra for the hardware, I’m pretty frustrated that I would have to pay even more money every month to keep this device connected to the internet. In that spirit, I purchased the non-3G model and am determined to use one of my two other mobile connections to provide simple access to the web on my iPad. I may need to look no further than Sprint for this. 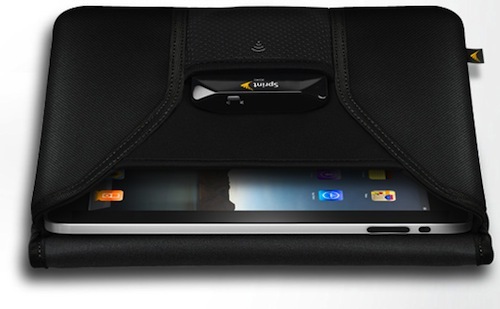 Sprint has announced a new case for the iPad, which has a rather unique front pocket. Okay, so the pocket isn’t that unique, but rather it’s what lies inside that pocket that matters. In that pocket you can place one of their Overdrive 3G routers, which will provide an internet connection to your iPad (or any other devices) via WiFi. You’ll be able to connect up to 5 devices at once (you’ll have to authorize them so that no one leeches off of your internets) to Sprint’s 3G or 4G network, depending on your area. The case is actually a freebie from Sprint, if you buy one of their Overdrive routers. The router will set you back around $100 after a rebate and a new 2-year contract. You’ll also have to pay $60 a month for the service, which will get you 5GB of data. Yes, it’s more expensive than purchasing service on the iPad each month through AT&T, but some of us are already paying Sprint $60 just to connect our laptops. Kudos to them for seeing this opportunity and seizing it. It’s hard to say who is the best wireless provider here in the US. I’ve used a few, and my vote would be for Sprint. Sure, I use AT&T right now, but that’s because I love my iPhone too much, and even unlocked it wouldn’t work on Sprint’s network. When I did have a Sprint phone, the service was great and the data was always fast. Now it seems that there is another reason for them to be considered the best. 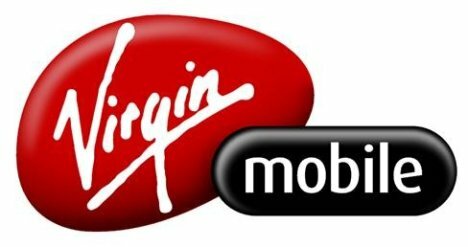 If you want unlimited calling to any mobile phone (regardless of carrier), unlimited texting and unlimited data, you can now get it for just $70. You’ll also get 450 anytime minutes to call landline phones, or to use when roaming. That’s one hell of a deal. I pay almost $100 a month for my iPhone plan, and I don’t get unlimited mobile calls or unlimited texts. Here’s to hoping AT&T gets around to lowering their prices to stay competitive! By Chris Scott Barr on 07/31/09 • Leave a comment! I’m really starting to wonder if there’s really any point it signing up for wireless service with a company that isn’t Verizon, AT&T or Sprint. Sure, they might offer some great deals, and you get that wonderful feeling of “fighting the man” by going with the little guy. But the ugly truth is that you’re only delaying the inevitable. It’s just a matter of time before your favorite provider is gobbled up by the big boys. Sure, I sound a bit cynical, but at the beginning of the year Alltell was acquired by Verizon, and now Sprint has bought Virgin Mobile (who acquired Helio last year). Yes, Sprint did have a 13.1% stake in the company before, but now they proudly own the whole company. So I really do wonder, how much longer before we’re just down to be big 3? By Shane McGlaun on 06/08/09 • Leave a comment! I got a text from my mother-in-law the other day, which was weird. For one reason, I don’t like to talk to her that much, any married guy will understand. The other reason is that I didn’t know she knew what texting was and she has a phone that is older than my kids. Sprint has a new entry-level phone for people like her that are just getting into texting and want a cheap phone to make things easier. The Sanyo SCP-2700 is cheap enough at $29.99 after an instant $150 rebate, a $50 mail-in rebate, and a 2-year contract. The device sports a full QWERTY keyboard and can access work email from Exchange or Domino. 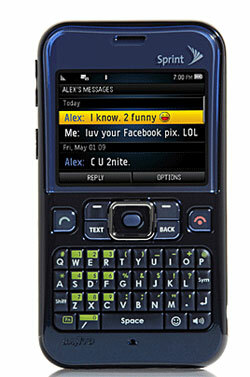 The handset can also access the web and social networking sites. Other features include GPS navigation support, Sprint Family Locator Support, and picture mail support. By Shane McGlaun on 04/01/09 • Leave a comment! One of the myriad of new smartphones to debut last summer and try to match wits, coolness, and usability with the iPhone was the Samsung Instinct, which was a Sprint exclusive. The handset was cool by many accounts, but didn’t really stack up to the iPhone. 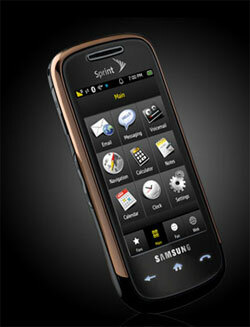 Sprint and Samsung have announced that a new and Sprint exclusive Instinct s30 will be coming this month. The new handset offers a thinner profile and two color options including Cobalt Metal or Touch of Copper hues. Sprint says that the device can receive email and access corporate email servers at no additional charge.